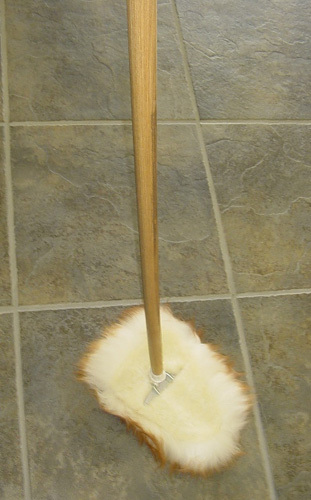 The Lambswool Dust mop is a dandy! The unique shape and design allows for reach into every little nook and cranny. It comes equipped with a sturdy wooden handle. The Original Wool Shop Duster is magic in your hands with its quick and efficient method of removing dust! Whether you are doing daily cleaning, preparing for company or scurrying when last minute friends drop by, the Original Wool Shop Duster will make your dusting an easier task. Its unique ability to attract and hold dust has made it America’s Favorite duster. Thousands of soft, dense lambswool fibers act as a magnet to naturally attract and hold dust particles without the use of cleaning chemicals or aerosols. Quality Assurance: In 1983, the Wool Shop set out to become one of the nations’ leading manufacturers of lambswool products. Over the years, they have remained committed to providing high quality products their customers have come to know and expect, from their strict quality procedures to their friendly customer service.